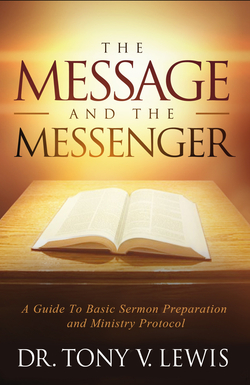 HOUSTON, April 15, 2019 /Christian Newswire/ -- "The Message and the Messenger" may be the first and last book you will need on basic sermon preparation. Written from a scholarly but pastoral perspective, Dr. Tony V. Lewis, President of Christian Bible Institute and Seminary, provides a great concise guide in preparing not only the sermon, but the preacher, for a lifetime of ministerial service from the pulpit. In the opening pages of the book, Dr. Lewis writes, "The call to ministry and to preaching is also a call to preparation and a call to study." This book gives the reader spiritual, academic, and practical ways in which they can prepare themselves for a lifetime of preaching. The Message and the Messenger (ISBN-13: 978-0692651780, Trade Paper, $18.95; ISBN-10: 0692651780 136 pages, from Jabez Publishing House www.cityofjabez.com, is also available from http://tvlewisbooks.com. The eBook can be purchased from FaithLife https://www.ebooks.faithlife.com for $11.37 More information on The Message and the Messenger can be found at https://www.cityofjabez.com. Dr. Lewis is the founder and president of Christian Bible Institute and Seminary. He also serves as Senior Pastor of the Dwelling Place of God Christian Fellowship Church in Houston, Texas. Dr. Lewis has earned both Bachelor of Theology and Master of Divinity degrees, a Ph.D. in Theology, and a Doctorate in Christian Counseling. Dr. Lewis is a Certified Christian Counselor, Anger Management Specialist, Integrated Marriage and Family Therapist, Christian Chaplain and Biblical Life Coach. He is also the author of The Wife He Wants "What A Godly Man Seeks In A Wife" and Word Potential "Essays On The Faculty Of Spoken Words." Jabez Publishing House (https://www.cityofjabez.com) is a Christian publishing company helping authors edit their manuscripts, publish, print and successfully market their books nationwide.